If you were a kid in the late 70’s and early 80’s it is likely you will have owned, or knew someone who owned a Grandstand handheld game. For many retro gamers this was their first real “video game” – for me it was Galaxy Invader, but games like Astro Wars and Munchman were also incredibly popular. 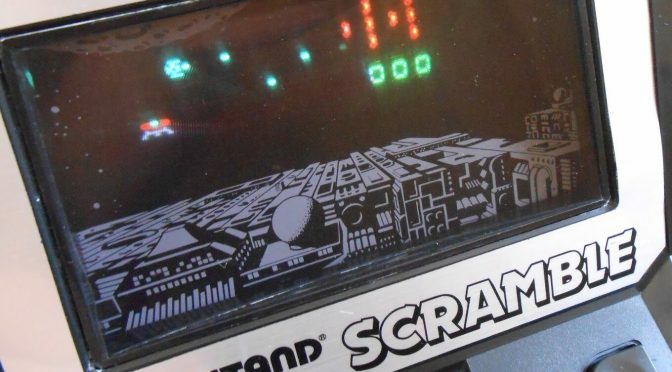 These were handheld versions of popular arcade games such as Galaxians and Pac-man, but only one of these Granstand games was named after an arcade original, and that was Scramble. The arcade Scramble was one of the earliest side scrolling shooters, relased by Konami in 1981 and set the format for such classics as Gradius and R-Type. 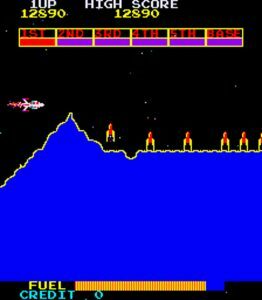 The arcade version of Scramble featured a novel weapon configuration of a front facing missile, and bomb which followed a realistic arc to destroy ground based enemies. As an additional twist, you had limited fuel, and had to destroy fuel depots in order to top up (not quite sure of the logic here). This introduced a risk / reward element to the game, requiring you to concentrate not only on avoiding the scenery and enemies, but also keep up your rocket fuel levels to stay in the air. Grandstand Scramble followed a similar in not identical format, a neat trick considering the limited capabilities of the Vacuum flourescent Display (VFD) which could only show fixed graphical images which could be turned on and off, like the LCD display of a Nintendo Game & Watch. Unlike earlier Grandstand games, the VFD was multi coloured, and through clever use of the space managed to pack in multiple images into each square on the screen, allowing the display of a missile one moment, and a spaceship the next. 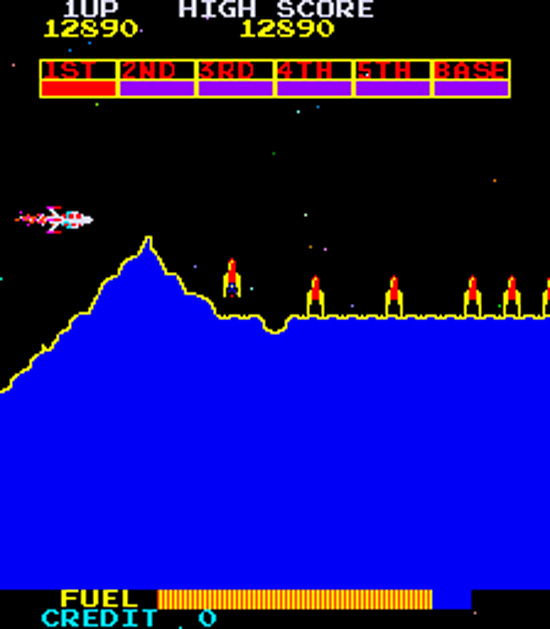 By scrolling the bottom layer of laser turrets, the impression of movement was acheived, with your player ship on the left of the screen shooting to the right. 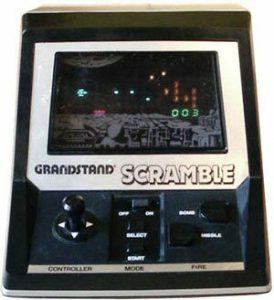 Before you get to the display though, the first thing that strikes you about Grandstand Scramble is the size of the game, this is no handheld, not unless you are a weightlifter, its more a tabletop game, and is best played resting on a flat surface. You could use an adapter, but if you wanted it truly portable you were looking filling it with “D” type batteries, the biggest and heaviest you can get, and normally only used these days in high powered torches. With these loaded the game is VERY heavy. The other thing you notice when you fire up the game is the sound, which is incredibly loud, and would be extremely annoying to anyone within shouting distance. With no headphone option, the game is best played alone, in a locked and soundproofed room. Controls were well thought out, with a proper joystick and separate bomb and missile buttons, and a big on off switch. Everything feels very physical, and you imagine the individual plastic buttons connecting with the metal switches beneath as you play. The objective of the game was not identical to the arcade version, as there was no scenery, and no requirement to refuel, just shoot enemies, bomb the ground based gun emplacements, and get to the end of the game before losing the 3 lives available. The differences are probably down to the fact that the game was not designed to be a Scramble clone, but a rebranded version of a Japanese game from Epoch called Astro Warrior. Presumably Grandstand thought it would sell more with the arcade association. There were 2 versions available, the only difference seeming to be the colour of the word Scramble on the front of the game. I have both (see my video below), and that’s the only difference I could find between the 2. 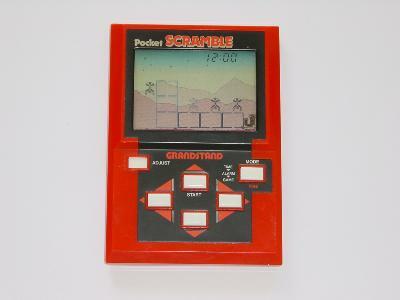 Grandstand also released a Game & Watch style version of Scramble with an LCD screen and virtually identical gameplay to the arcade game – this time a true handheld, powered by watch batteries, which you could fit in a shirt pocket. What happened to Grandstand Games? Not much is documented about the Grandstand company other than it imported and rebranded its products from manufacturers such as Epoch and Tomy, releasing games in the UK and New Zealand, and that it ceased to exist some time in the Eighties. For a company with such a short career, it managed to make its mark on a whole generation of gamers, and produced some games that were so well built that they are still being used 30 years later. Grandstand Scramble Tabletop Video Game 1982 Boxed + Adapter!